The most common choice of solar systems is one that is connected to the electric grid with no batteries. 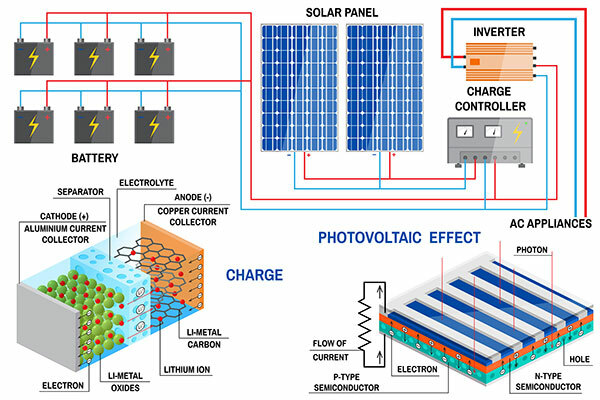 When the sun is out the panels convert sun energy into electricity. 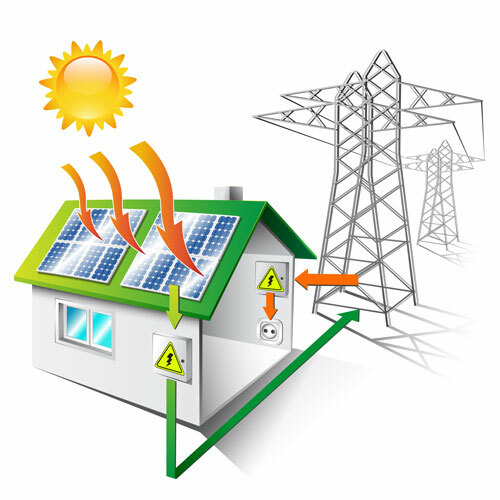 If you are using electrical power at that time the electricity from the solar energy systems flows directly to the load. Any excess energy produced at that time flows back to the utility through your electric meter. The meter is bidirectional; adding or subtracting kilowatt hours from your monthly total kilowatt hours. You will still get a bill from your utility. 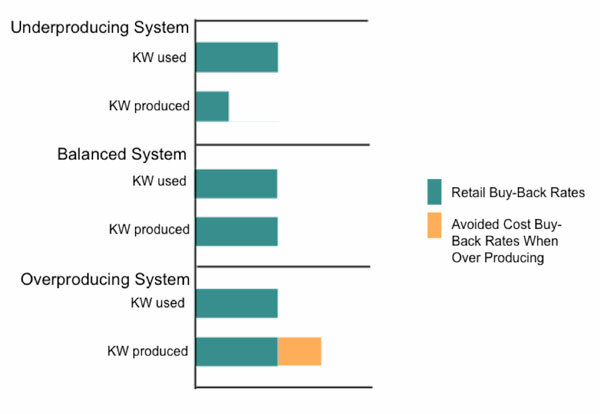 Sizing: This type of system is sized so that you never produce more energy in a billing cycle than you would use. This is to ensure you get the best return on your investment. Add the number of kW hours used in a year and divide by 1200. For example, the following client has an average of 6000 kWh per year. Remember this is to get an idea only; the actual numbers that we use involve many other variables to figure out a correct system size for your situation. Utility buyback policy drives system sizing for grid intertie without battery storage systems in Wisconsin today. A utility pays you the same amount that you pay them for every kilowatt of electricity only up to what you use in a billing cycle they will pay wholesale, or avoided, costs. Retail costs are roughly around $0.12 and avoided costs are roughly $0.04 so if you don't overproduce you are making the most for your money. An under producing or fairly balanced system are most cost efficient. An overproducing system has a longer payback. Some people choose to overproduce so that there is more solar generation on the grid. Off-grid means the system will have batteries for electric storage at the house. There will be no connection to the grid; and no electric bill. This is the most independent and self-sufficient option. The difficulty is during the winter when the sun is at its lowest intensity and availability because of clouds and shorter days. Typically, it is difficult for a solar electric system to provide 100% of the electricity during the cloudiest months of winter, November and December. During these months another form of electrical generation, like a generator, is usually used as backup to fill in the blanks. Sizing: Sizing for an off-grid system includes getting a load profile to see what energy the customer uses over time. This requires information about what the customer expects to run, during what times of the year, how often, and the wattage. If the customer has had electricity at the site previously, we will want to know the source and usage. This system is a combination of utility intertie and a battery system. It provides energy security because the battery system automatically takes over to provide home power when there is a utility power outage. This is the best of both worlds. It is often the most expensive system because it has components from both the battery and utility intertie system together. This type of system typically has a smaller battery system than an off-grid system because the battery bank is sized to provide power only during a utility power outage and for a specified length of time such as one day. Sizing: The sizing of the system is the same as a utility intertie system without batteries with the addition of a load profile to see how much electricity is required to run the critical electric loads in your home when the utility is off. There is also consideration taken about the duration that the customer would need to run these critical loads. There are a lot of variables with battery systems of all types; so, we work with our customers to meet their needs. The biggest concern people have when discussing location of the array and the roof is "will it leak?" if short, no. Modern technology has developed ways to protect your roof from water damage. There will be penetrations made in the roof in order to attach the panels securely, but parts are used to cause the water to run around and away from those holes. We use a raised barrier that diverts water from the attachment point and gaskets to create a reliable seal between the roof and attachment. For those who have metal roofs, there are sometimes other options that require even fewer penetrations especially if you have a standing seam metal roof. For these sites, there are clamps that attach to the metal seams instead. Oftentimes roof mounts are easier and cheaper because they do not require trenching and can have shorter wire runs. Roof mounts are generally mounted to flush to the roof rather than tilting them at a different angle than the roof. The panels are attached to rails, and the rails are connected to the roof. South facing roofs are best, but west or east facing roofs can also work well. While the good technology exists for racking that will avoid any leakage; we at PV Systems would like to caution you that not all companies are reputable or will use the correct parts in their systems. Please make sure to check references and types of racking when discussing solar options. Some locations do not have options for roof array or simply do not want them. Never fear! Ground mounts are another great choice. Ground mounts installed by PV Systems require multiple 7 ft. holes to be drilled into the ground and filled with concrete to hold the rackings/rails which support the panels. Ours are rated for up to 110 mile per hour winds. The wiring is then trenched back to the house/meter. Ground mounts have traditionally been slightly more expensive than roof mounts, but those costs are now leveling out. When compared to roof mounts; ground tend to perform slightly better because we can control for the optimal tilt and placement in sunnier locations. Rural Solar - many of our installed systems are rural. Oftentimes these customers think more about options including batteries if they tend to have long power outages. Remote - Remote areas that either have no grid access or it would be costly to add grid access are great locations to look into solar; especially if it means not running generators constantly. Aeration Systems - Stand-alone solar systems can be used to power aeration systems in ponds for greener, easier solutions. Pumping - We also have installed systems for pumping water. This can be a backup in case the power is out so that you still have access to water. Cathodic Protection Systems - Need cathodic protection for your pipelines? Solar can do that too!